The “vishwas rally” of the Haryana Janhit Congress of former Chief Minister Bhajan Lal received a lukewarm response here today in spite of tall claims of party president Kuldeep Bishnoi to contest all 10 Lok Sabha seats and win the elections. Former minister and Bharatiya Janata Party legislator from Taranagar Rajinder Singh Rathore today met victims of the police firing at Sidhmukh in Churu district of Rajasthan yesterday, who are undergoing treatment in local hospitals. The CPM today alleged that most mainstream political parties continued to be indifferent to the plight of socially and economically deprived people. Alleging that the law and order situation has deteriorated in the state, INLD secretary-general and MP Ajay Singh Chautala today said “fake encounters” were a blot on the state. The ongoing Surajkund Crafts Mela has become a big draw among residents of the millennium city, who literally made a beeline to visit the annual fair this weekend. While many residents want such events to be organised in the vicinity of Gurgaon, many others have rated it above the international trade fair organised in Pragati Maidan in New Delhi. The police today produced before a local court the person charged with killing and cooking a deer in Bighar village in this district on February 2 and obtained one day’s police remand for recovering the skin of the protected animal. Electronic voting machines (EVM) will be used for the first time in municipal elections in Haryana slated for 2010. Keeping in view the encouraging response of the people towards Rashtriya Swasthya Bima Yojna, the Haryana government has extended the scheme to all districts in the state. A 12-member panel of experts headed by Haryana Agricultural University Vice-Chancellor JC Katyal, set up to suggest changes in syllabi and courses run by agricultural universities of the country, has submitted its report to the Union Agriculture Ministry. The Haryana Janhit Congress has demanded a CBI inquiry into the release of land by the state government after the start of acquisition proceedings at several places in the state. The Dakshin Haryana Bijli Vitran Nigam (DHBVN) and the Uttar Haryana Bijli Vitran Nigam (UHBVN) have decided to launch the surcharge waiver scheme for all categories of consumers in urban as well as rural areas with immediate effect. The scheme will remain open till March 31. A case has been registered Vikas and Sanjit of Gumar village, Dalel of Rewali and four or five others for allegedly looting Rs 24 lakh. The district police has arrested Dalbir, a resident of Barna village near here, under Section 302 of the IPC for allegedly shooting Om Prakash, a resident of Munda Khera village near here, near Didar Nagar on the Kurukshetra-Pehowa road on Friday night. In the wake of the brutal beating up of a six-year-old girl by cops in Uttar Pradesh, the director of the Haryana Police Academy (HPA), Madhuban, BN Roy, has asked all SPs of the state to strictly follow the Juvenile Justice Act to treat juveniles involved in crimes with care and protection. The police has arrested two persons and seized fake currency notes and arms from their possession. However, undeterred by the poor response, Bishnoi lashed out at both the Congress and the INLD-BJP alliance to project the HJC as the natural choice for voters. Describing the “chetna rally” of INLD leader Ajay Chautala as a political stunt, he said fear and corruption reigned supreme during the INLD rule and bitter memories of those days were still fresh in minds of people. Bishnoi alleged that Chief Minister Bhupinder Singh Hooda failed to deliver and only encouraged casteism and regionalism. Blaming the Hooda government for failure to perform, Bishnoi said all problems like water and power shortage, bad condition of roads, unemployment and deterioration in law and order were created by the present government. The development of the state was only in papers and not visible on the ground, he added. Bishnoi promised to raise the retirement age of government employees from 58 to 60 years, interest-free loans of Rs 3 lakh to farmers for two years, old age pension after attaining age of 58 years instead of 60 years at present, unemployment allowance of Rs 600 per month to women and filling of 1.10 lakh vacant posts within a year after coming to power. He charged both the Congress and the INLD-BJP alliance of deliberately keeping over 1 lakh posts vacant and said if returned to power, the HJC would enact a law on the very first day to fill these posts. Sensing the brewing resentment among the unemployed youth and guest teachers, the HJC leader said preference would be given to 20,000 guest teachers and 16,000 terminated teachers. At least one person in every family would be given employment in the state sector, he promised. He said former Haryana minister Krishan Murty Hooda would be the HJC candidate from the Rohtak Lok Sabha seat. The names of Chander Bhatia from Faridabad and Narbir from Gurgaon had already been announced and the candidates for the remaining seven seats would be announced soon. He made it clear that the HJC would go it alone and not truck with any other party in the coming Lok Sabha elections. The HJC got a boost with former minister Chowdhary Satbir Singh announcing his decision to join the party. Talking to mediapersons here, he demanded a probe into the incident by a retired judge of the Rajasthan High Court. He alleged that the unprovoked firing by the police was the result of an altercation some police officials had with the demonstrators before the firing. Rathore said the cops had themselves set the police station afire which was clear from the fact that even though the fly-proof doors of windows were intact, the glass panes were found broken from the inside. He said even though the state government had announced that the expenses for the treatment of victims would be borne by it, no official had come here to take care of the victims. Rathore assailed the Congress government in Rajasthan, saying that the Sidhmukh incident was the third such incident in the two months that it had been in power. One person was killed and seven others were seriously injured when the police opened fire yesterday on a mob in Sidhmukh which was demonstrating against the murder of Bahujan Samaj Party leader Virender Nangli a day earlier. The injured were brought to three local hospitals for treatment. Talking to mediapersons here, Inderjit Singh, state secretary of the CPM, maintained that his party was the only one that was sincere and honest in espousing pro-people politics. Inderjit Singh, who addressed meetings in over a dozen villages in Sirsa district today to mobilise support for the February 15 Fatehabad rally to be addressed by Parkash Karat, said the only issue before the mainstream parties was to grab power. He accused the Congress-led UPA government at the Centre and those ruling in various states of colluding with vested interests and not implementing social security schemes like the National Rural Employment Guarantee Scheme, debt waiver and other policies meant for poor. The CPM leader alleged that for want of these relief measures, the common man was suffering from rising prices of essential commodities. Even more worrying, he said, was the backward social milieu that was making weaker sections, especially women, more vulnerable. 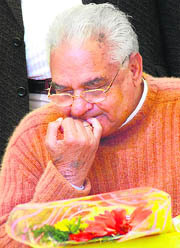 He disputed the tall claims made by the Bhupinder Singh Hooda government with regard to development and stated that the condition of agriculture, health, education and service sectors was crisis-ridden and nothing was being done to create jobs. He said joblessness was assuming alarming proportions in the state, which was driving the youth towards crime. He criticised the INLD for entering into an “opportunistic” alliance with a “rabid divisive force like the BJP”. The CPM leader claimed that the Fatehabad rally would set the peoples’ agenda prior to the Lok Sabha elections. He visited Khuiyan Nepalpur, Jodhpuria, Fatehpuria, Shekhupuria, Begu, Ahmadpur and some other villages for mobilising support for the February 15 “janpaksh rally” at Fatehabad to be addressed by party general secretary Prakash Karat. He further said if voted to power in the coming assembly elections, the INLD would conduct an inquiry on all “fake encounters” by the police and the culprits would be put behind the bars. The ‘janakrosh padyatra’ undertaken by Chautala and his supporters was received here by party workers in Saravan village, 30 km from here, this evening. Blaming the Congress government, he further alleged that the law and order situation had totally collapsed in the state and the police was killing innocent people on the pretext of police encounters. Meanwhile, the administration under the present regime had become tyrant and autocratic in the state, he added. Speaking to mediapersons, he further blamed the government for not taking action against the guilty police officials. He said killing innocent people had become a routine with the Haryana police. Recently, the Haryana police had killed Jaswir Singh Jassa, a resident of Dhakla village, in a “fake encounter”. A Bhiwani schoolgirl and another villager from Gaaranpura Tosham were also killed in a “fake encounter”. Vikas, son of Jaipal, a resident of Dulhera village in Bahadurgarh, was killed by the police in a fake encounter. A guest teacher from Jind was also killed by the police in the police firing, he further said. 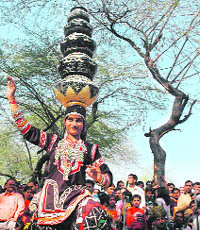 The ongoing Surajkund Crafts Mela has become a big draw among residents of the millennium city, who literally made a beeline to visit the annual fair this weekend. While many residents want such events to be organised in the vicinity of Gurgaon, many others have rated it above the international trade fair organised in Pragati Maidan in New Delhi. “We have been visiting the Surajkund mela for several years and it is heartening to note that the fair is getting better with every passing year,” opines Shweta, a media professional based in Gurgaon. Her views were endorsed by a cross-section of local residents approached for their comments. However, the residents do feel that the parking arrangement at the mela site needs to be streamlined. “There is no denying the fact that it is difficult to manage a huge number of visitors and vehicles, simultaneously maintaining a smooth flow of traffic on the main road leading to the mela venue. Still, better arrangements can be put in place to ensure that the visitors are not put to inconvenience,” said Rajesh, a Gurgaon-based telecom engineer. Big traffic jams on the road leading to Surajkund, especially during the weekend, amply proved their point. But on the whole, most residents returned from the fair with fond memories which they would cherish. Many plan to visit the fair again, albeit they said they would now go there on a working day to avoid heavy rush. While Madhya Pradesh is the theme state at the ongoing crafts mela, craftsmen from different parts of the country as well as abroad have displayed their impressive creations at the fair. Earlier, the accused, Chander Bhan, who along with his two sons Mohinder and Rajinder had had been booked under the Wildlife Protection Act, surrendered before the police in the morning. His two sons are still at large. According to Yogesh Kumar, SHO, Sadar, Fatehabad, the accused has confessed to having killed the deer and cooking it at his residence. He has told the police that he had fired into the air to shoo away animals from his agriculture fields, when a stray splinter accidentally hit a deer, who died. He has also told the police that he cooked some of the meat, while some other was thrown away for stray dogs. He has informed the police that he threw away the skin in the fields, but the police has so far not been able to recover it. Bhup Singh Godara, husband of the village sarpanch and executive member of the Bishnoi Mandir here, had raided Chander Bhan’s house with members of his Bishnoi community after getting a tip-off that he was cooking deer, a protected animal under the WildLife Protection Act. Initially, he maintained that he was cooking goat’s meat, but when probed further on the name of the butcher from where he had purchased the meat, Chander Bhan admitted to having killed a deer. He and his sons Mohinder and Rajinder, however, escaped before the police and wildlife officials, who were informed by Godara, reached there. The wildlfe officials and the police had taken samples of the cooked as well as the raw meat lying at his residence and booked the three under Sections 39 and 51 of the Wildlife Protection Act, 1972. However, the accused admitted to his crime before the report of the samples could reach here. Stating this here recently, State Election Commissioner Chander Singh said about 25,000 EVMs would be required for holding elections to 67 urban local bodies in the state. The state had 3,500 EVMs at present and another 1,500 EVMs would be procured in course of time while the Election Commission of India would be requested to provide 20,000 EVMs. Already, EVMs are being used in the byelections of zila parishad members, sarpanches and upsarpanches, he added. However, he was non-committal on the preparation of electronic photo electoral rolls to check bogus voting and stated that it required huge funds. Any decision in this regard would have to be taken by the government. aware and check their names immediately after the provisional voter lists were released and displayed. Chander Singh, who was here in connection with the non-filing of the registration fee by 15 persons during the elections to the Nilokheri Municipal Council, said a mandatory provision had been made by the commission for furnishing details of the expenditure incurred during the poll by individual candidates. He parried questions regarding reservation for women in urban local bodies and PRIs and said these issues fell in the domain of the state and the commission was confined to the holding of free and fair elections. Earlier, the scheme was being implemented in nine districts, including Faridabad, Palwal, Yamunanagar, Panipat, Bhiwani, Ambala, Rohtak, Mewat and Hisar, through the empanelled government, charitable as well as private hospitals. Naresh Gulati, financial commissioner and principal secretary to the Labour Department, who was here yesterday to preside over a workshop in connection with the implementation of the scheme, said the scheme aimed at providing free health care and medical services to below poverty line families made a significant progress and therefore it had been extended to the remaining twelve districts also. Gulati said the aim of the workshop was to explain salient features of the operational part of the scheme and disclosed that Haryana was the first state in the country to implement this novel scheme. Under the scheme, smart cards would be issued to BPL families to enable them to derive full benefits. Haryana Labour Commissioner NC Wadhva said three members of a BPL family could avail health care facilities to the tune of Rs 30,000 per year under the scheme. He said the beneficiaries would not be required to pay any premium to the insurance companies under the scheme as the amount of the premium would be shared by the union government and the state government in the ratio of 75:25. Katyal told newspersons here yesterday that the 2,500-page report compiled with the help of over 1,000 experts had suggested reduction in the number of courses at present being run by various agricultural universities from 95 to 83. It has suggested that greater emphasis should be laid on fishery, veterinary and forestry courses. He said the panel had found that agriculture education had lost its charm and had become the last resort for the youth. On an average 30 per cent of seats in various universities remained vacant. In view of this the panel had suggested that these seats should be offered to candidates from outside the state. The panel has recommended opening of multi-faculty centres in the subjects of biotechnology, climate change and food technology. He said the restructured curricula also included courses on post-harvest technology, commercial entomology, fisheries, aquatic environment management, bio-security and bio-safety. Katyal said the panel had suggested that the Indian Council for Agricultural Research should raise the number of fellowships for postgraduate students from 475 to 1,000 and for doctoral degree courses from 200 to 500 a year. He said more emphasis would be laid on teacehers’ in-service training to hone their skills. The panel had suggested that the ICAR adopt one agricultural university every year for improving its infrastructure and teaching standards. The ICAR should spend Rs 100 crore for the purpose on that particular university in one year. In a statement issued here yesterday, spokesman for the party Satpal Kaushik alleged that the release of land from the acquisition proceedings was one of the biggest scandals of the country. This, he said, had been proved by several decisions of the Punjab and Haryana High Court quashing the release of land. He alleged that innocent farmers were first “intimidated” to sell their land to private builders by issuing them acquisition notices. After the builders purchased land at dirt cheap rates, the land was released by the government to benefit the builders. Managing director, DHBVN, Anurag Agarwal said here yesterday that the scheme would be applicable for only those consumers who were defaulters on December 31, 2008, and continued as such. Complete surcharge of such consumers would be waived on liquidation of total outstanding principal amount in lump sum. He mentioned that defaulter consumers whose theft cases were pending in courts would also be covered under this scheme. However, they would have to give an undertaking for withdrawal of their cases from the courts. Those cases would not be covered under the scheme where consumers were detected stealing power for the second time. In case of wrong billing, the bills would be corrected as per the prevailing instructions of the nigam. The case was registered under Sections 382 and 506 of the IPC on February 4 on a complaint of Sat Pal of Sector 14 here. The complainant had alleged that on January 13 when he was talking to Vinod in Delhi regarding the collection of Rs 24 lakh on phone, the conversation was heard by Vikas and Sanjit. They insisted to accompany him to Delhi and he along with them went to Delhi. He said, after collecting the amount, when they reached near Sector 12 here late that night, Vikas suddenly stopped the car and Sat Pal took out his revolver. Meanwhile, four or five other persons also reached the spot in a car. They allegedly looted Rs 24 lakh from him and sped away in the car. He said he did not report the incident earlier as he was under shock. He alleged that 10 days after the incident, Vikas, Sanjit and Dalel threatened him with dire consequences if he reported the incident to the police. Stating this to mediapersons here yesterday, DSP Mahender Singh said a complaint was lodged by Jagdish, brother of the deceased, that Om Prakash was shot dead by Dalbir. Following this, a police team arrested the accused from near the railway crossing on the Kurukshetra-Jyotisar road here yesterday. The police said during interrogation, Dalbir confessed that he shot dead Om Prakash with his licensed revolver on Friday night and escaped. Old rivalry was stated to be the reason. A copy of the letter containing 18 guidelines on how to treat juvenile cases has also been sent to the DGPs and the IGs. SP Vikas Arora said the director of the HPA stated that the guidelines to be followed under the Juvenile Justice Act should be sent to all police stations for its implementation. The arrested have been identified as Sonu of Issapur Kheri and Ravinder of Baliana in Rohtak district. Cases have been registered against them. According to SSP Navdeep Singh Virk, after the arrest of Sonu near Sector 23 here, the police seized a country-made pistol, four cartridges and two bundles of fake currency notes each of Rs 50 denomination. During interrogation, he said around one and a half months ago, he had exchanged Rs 10,000 with fake currency notes amounting to Rs 20,000 from Navratan through Kala of Bapora village in Bhiwani. He also confessed to have already used fake currency notes worth Rs 10,000 at different places and looted two motorcycles and committed thefts in Sandal village here, the SSP said. Acting on his information, the police arrested Ravinder of Baliana village and seized a country-made pistol from his possession. He also confessed to have committed loot and theft along with Sonu, the SSP added.